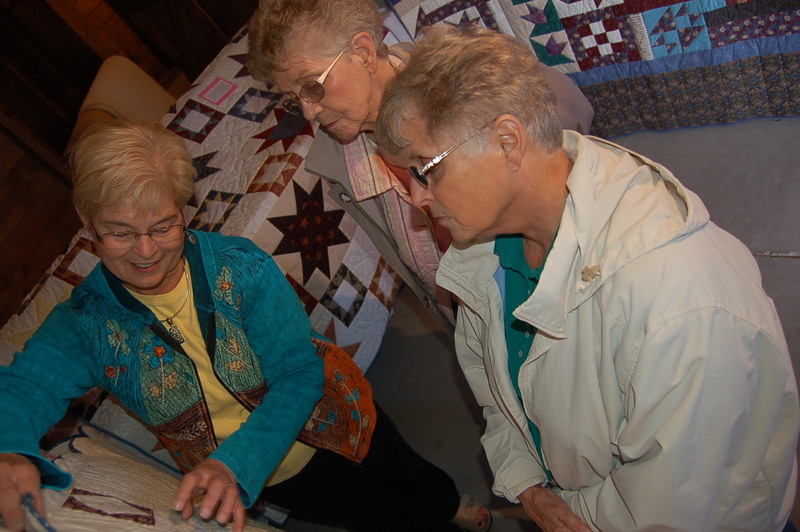 Maxine Bergen shows the backing of a quilt to Marj Smith and Peggy Friesen. The weather on both days of Henderson’s Q125/Mennonite Heritage Park Quilt Show was pleasant and visitors arrived from across the state – and some from out-of-state – to enjoy the display. The guestbook was signed with hometowns including Lincoln, Seward, Diller and Fairmont in Nebraska, as well as such places as San Francisco, CA and Colorado Springs, CO.
Several of the nine featured quilters were on hand each day to host and explain techniques and design choices made on their own handiwork. The proceeds from the show were split equally between the Q125 Celebration Fund and the Henderson Mennonite Heritage Park. Many more special events are scheduled through out 2012 to celebrate the 125th anniversary of the founding of the City of Henderson. Watch local print and on-line news sources to stay informed on upcoming events.